Marketing is for happy & enthusiastic persons! It is for those individuals for whom happiness is a habit and enthusiasm is a way of life!! Marketing is about creating a value delivery process, which finally creates happiness in the consumer. Marketing is the creation, communication and delivery of value to enhance the exchange process, market penetration and consumption. Marketing activities should fuel the buzz: strengthen "word of mouth" among stakeholders. All in all, it should finally create the “feel good” in the consumer/stakeholders. And for this, marketers have to be happy: only then can they create happiness in the target audience through their "happy marketing activities"! Marketers provide value and benefits. These create cheer in the beneficiaries. To create cheerful prepositions, the marketer’s disposition should also be cheerful! A morose marketer cannot create happiness in the target audience. Pharmaceutical marketers have more responsibility. This is because patients (like farmers) do not get to choose/bargain - the price of the purchased pharma product - normally. For instance, a typical farmer in India, takes his produce to the 'mandi' (agri market) and gets the prevailing price of the mandi for his product (he cannot choose the price for his product). He gets the price for his product in the mandi as per prevailing rate. Similarly, the patient, takes the prescription to the pharmacy, and buys the brand indicated by the doctor: rarely does the patient ask for equivalent unbranded generics or cheaper equivalent brands. In this regard, even though the patient may have a choice, he is like the farmer who is the price taker (not price maker). Hence, pharmaceutical marketers (who are the price makers) have a lot of professional burden to justify the price for his or her product. To make a pharma brand succeed continuously - several approaches are required to pep-up the demand: these include in-clinic activity, in-pharmacy activity, taxi tours, stall activity, group meetings (with sponsored high tea, lunch etc) and specific campaigns: targeting doctors and pharmacists - sometimes nutritionists and other paramedical/allied medical people - are also targeted. 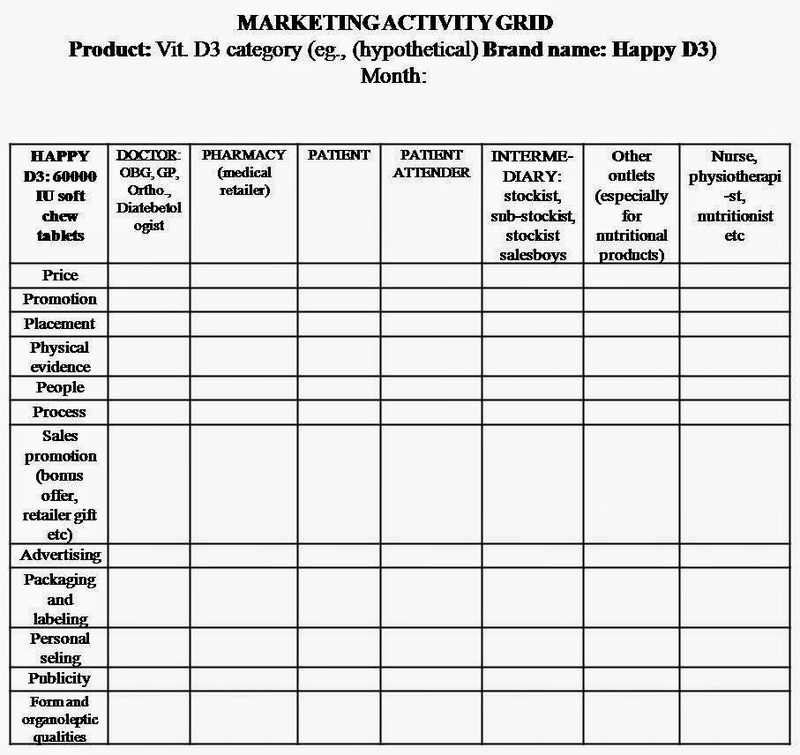 In the above grid, marketing work parameters are on the left first column for the hypothetical brand: Happy D3 soft chew tablets (60000 IU). And the first row gives the categories of people or entities to whom marketing collaterals, activities and campaigns have to be targeted. So in each cell, the marketing person can plan the activity or collateral or strategy (direction for application of resources and efforts). The price for instance needs to be put in a different fashion to the doctor; and in different terms to the pharmacy (where the pharmacist will be interested in his margin etc). Promotion refers to the plan of campaigns, in-pharmacy activities, in-clinic activities etc depending on the target category. Thus the idea is to use the above grid to creatively produce inputs and strategies without any loose ends. This helps bullet-proof marketing activities. This approach will provide better marketing results. (If you want to see the above image in bigger size, click on the image). Pharmaceutical marketing is responsible marketing. Communication (messaging) and other marketing activities are addressed to educated and important customers/opinion builders. Scientific accuracy is vital in the communication items. It is after all a matter of health, life and death. Pharmaceutical marketers can ill afford to be irresponsible. In today's challenging scenario pharmaceutical marketers in India, have to creatively produce marketing collaterals, campaigns and strategies: while having to balance three things - marketing costs, profit targets, and justified product price-to-patient. In today’s context, with NPPA keeping a beagle eye on MRPs of pharmaceutical products, it is inevitable pharma marketers control marketing costs and get the best bang for the marketing buck. Resource constraint and competitor pressures (in the market) with the focus to deliver best ROI (return-on-investment) is the marketer’s stress today! And despite all these challenges, pharma marketers should have a happy positive attitude; enthusiastic frame of mind, and pharma marketers have to create happy stakeholders too (patients, patient attenders/family members, doctors, other opinion builders, pharmacies, and intermediaries)! This blogpost says: three cheers to pharma marketers - whose life is a bubble on water, you never know when it will burst - despite a good track record. Marketers are not umpires, they are players! So they get-out, get-hurt, or sometimes lose-out! This blogpost raises a toast to all the pharma marketers out there who wear their best smiles to suppress the worst stresses. Marketers smile because it is their best proven engagement tool. Thanks for reading this blogpost, please scroll down and read all other posts, and kindly recommend this blog to your acquaintances.